Software testing tutorial provides basic and advanced concepts of software testing. Our software testing tutorial is designed for beginners and professionals. 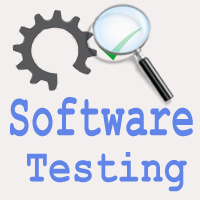 Software testing is widely used technology because it is compulsory to test each and every software before deployment. Our Software testing tutorial includes all topics of Software testing such as Methods such as BlackBox Testing, WhiteBox Testing, VisualBox Testing and GrayBox Testing. Levels such as Unit Testing, Integration Testing, Regression Testing, Functional Testing. System Testing, Acceptance Testing, Alpha Testing, Beta Testing, Non-Functional testing, Security Testing, Portability Testing. Before learning software testing, you should have basic knowledge of basic computer functionality, basic mathematics, computer language, and logical operators. Our software testing tutorial is designed for beginners and professionals. We assure that you will not find any problem in this Software Testing Tutorial. But if there is any mistake, please post the problem in contact form.